I wrote this up Tuesday night and I don't recommend purchase of the shares now but I suppose it's still worth sharing. Walker Innovation Inc is a nano cap company that trades OTC. They just filed their 10-K and showed an increase in cash to $10.285m and an unrealized gain of $7.6m. The increase in cash was in relation to "exercise and sale of 3.75m shares associated with its warrant to acquire shares of the Upside Commerce Group, a new business travel service founded and launched by Jay Walker". That's right, Jay Walker founded Priceline, so he is fairly competent in the travel space. 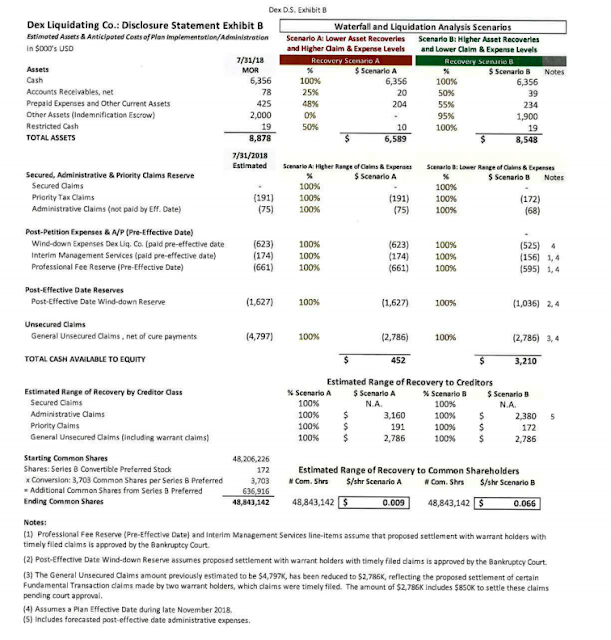 Total Liabilities equaled roughly 991k and operating income was profitable at 405k for the quarter. Effective February 3rd, Jonathan Ellenthal has stepped down as CEO and is working full time with Upside, which indirectly benefits WLKR due to the ownership of the warrants. Jay Walker has the company locked up with 82% of the common shares and 100% of the Series B Convertible Preferred Shares but companies don't trade at a huge discount to cash (even if you were to write down the remaining Upside Warrants to zero this was a buy at .32). They are looking to acquire an operating with the cash from the sale of the Upside warrants. What that company is will have a huge impact on future earnings, along with how well Upside performs. Objections to the Disclosure Statement are due on May 16th. 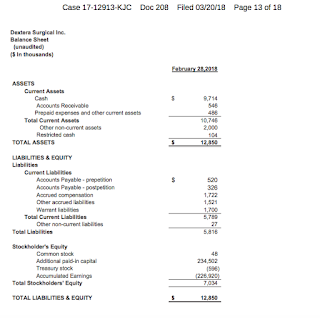 Dextera Surgical is a company in bankruptcy who's already sold substantially all their assets, along with the assumption of certain liabilities. 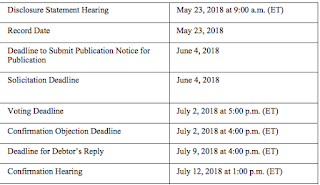 They filed a voluntary petition for reorganization on December 11th of last year to simplify the wind down process after entering into an APA with AesDex LLC. One important thing to note is that the bar date for general claims is April 11th so liabilities could possibly increase. The remainder of the wind down process will also mean additional expenses will be incurred. They motioned to retain Arch & Beam's Matthew English as their Chief Restructuring Officer.